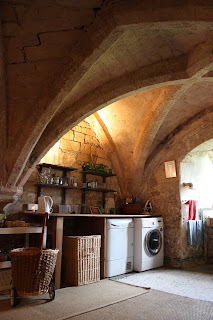 View from the Gatehouse: The most interesting Utility Room in North Yorkshire...? The most interesting Utility Room in North Yorkshire...? We are proud to announce - new for 2012 - the Markenfield Hall Utility Room... open to the public for the first time this year! But it's not just any old Utility Room. There are two small at the Hall that escaped the “modernisation” of the ground floor in 1569 and retain the original Mediaeval vaulting. Excitingly, it is believed that the two rooms that survived form the oldest part of the Hall and that they date from 1230. A section of the report by the late Professor Andor Gomme can be read by visitors on the room sheet for the Utility Room - it makes for truly fascinating reading.